With the shell of our shed built, we had lots of fiddly details to add (like a roof, door, and windows) to give the structure some character. We planted our border early on in the process so the plants would have time to get established before the summer heat set in. The border needed a good edging to keep the grass at bay and we were fortunate to find dozens of bricks buried next to the garage. Who knows what purpose they once served but they’re a boon to our design. We lined the bricks up at an angle to ensure we had enough to complete the outline of the bed. Since everyone else was busy on other tasks, I used my trusty trowel to bury the bricks in a trench that would keep them in place. While I was busy with the garden border, Hannah and Kurtis unload a pickup bed full of mulch. One wheelbarrow load at a time. We spread a nice thick layer of mulch over the new border to keep weeds in check and the ground moist. We got a second pickup load so we could cover the ground all the way to the fence and around the lilac shrub at the end of the border. The thick layer also makes pulling weeds a lot easier as well. They just root on the surface so you don’t have to deal with nearly as many rooted weeds. It all looks so uniform and finished now. The plants seem happier, too. This picture was taken a week or two after the other. It’s the little things that make plants happy. A bright yellow birdbath adds a focal point to the border. With the landscaping done, it’s back to the shed. Siding is placed beneath the truss overhang along both sides of the building and secured with nails. The edge needs to be flush with the end of the trusses. If you have a gap at the back, that’s okay. You can caulk that later. Narvas installs the 1×6-inch fascia at the ends of the trusses on both sides of the shed. The slight lip over the top of the truss will hold the roof sheathing in place before it’s nailed. Hannah is in the back doing the unglamorous work of holding the fascia in place while Narvas positions the board on his end. If you don’t have another person’s help, an extra ladder helps hold the boards up for you while you position. The roof sheathing (the boards that create the ceiling of the shed or the base for the shingles) is installed with the edge flush with the 2×4 boards on the gable. The plywood boards are cut to size and nailed in place. The bottom edge of the roof sheathing rests on the 1×6 fascia. A layer of roofing paper covers the plywood. This helps protect the shed from water damage. Hannah and Narvas then install 1×6-inch gable trim over the 2x4s on both front and back gables. Trim is installed flush with the top of the roof sheathing. Narvas and Andrew install metal roof edging around the entire perimeter of the roof. This helps protect the edges of the roof from rot caused by moisture. If you’re more of a visual learner there are also some great YouTube videos out there as well. The first and second course of shingles are pretty essential, and will set the pattern of the rest of the roof. Make sure you’re happy with them before moving on to do the rest. It’s fairly easy to correct any mistakes at this point, but if you get too far along, it will be very difficult to change it. While they’re shingling, Andrew uses an oscillating blade to cut square holes in the front and back gables for a pair of gable vents. 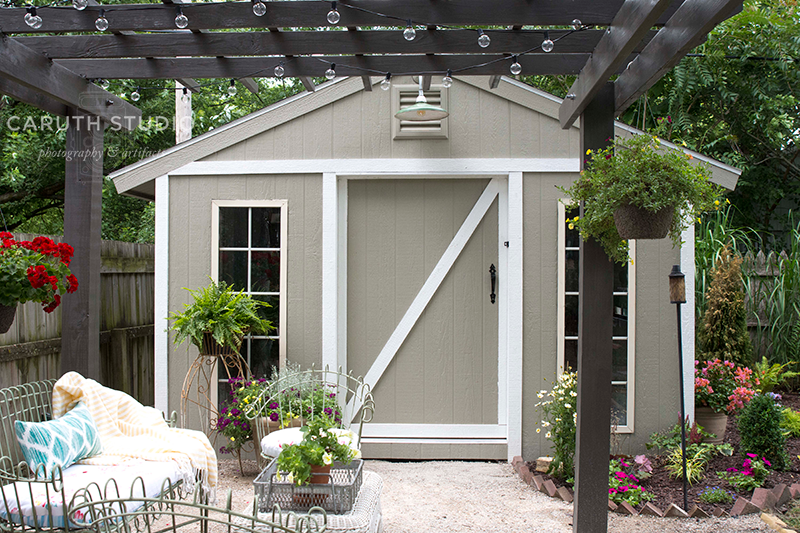 Trim boards from 1×4-inch SmartTrim are cut to length and installed at the four corners of the shed. Narvas caulks gaps in the soffit, fascia, and trim. After all the caulking, Narvas and Andrew cut the hole for the divided window on the side and measure for the trim. A neighbor was getting ready to toss these great windows so Hannah snatched them up. They’re the perfect size to flank the doorway. Between three windows and a wide doorway, there’s a lot of natural light inside the shed. And now we’re done. We have a lovely garden, a water proof-ish shed, windows for light.. the shed feels practically done! It’s that 3/4 mark, – the 2:30 pm work day slump of projects… push through it! Narvas stains the siding and trim using Olympic Paint’s Elite Solid Stain in Drift. We chose a color that would work well with the nearby garage. Narvas stains the front trim and side window trim using Olympic Paint’s Elite Solid Stain in Avalanche. This paint also matches the rest of the house and garage aesthetic. Kurtis and Narvas make a barn door to fit the 4-foot wide opening. It’s constructed from 2x4s and siding and will hang on hardware inside the shed. Following manufacturer’s instructions, Narvas and Kurtis installed the sliding door hardware and attached the rollers to the door. A door guide on the floor will keep it aligned with the doorway. Now that we know it’s going to fit, Hannah stains the door to match the exterior walls and trim. Kurtis measures, cuts, and installs the door facing. Looking like a big glass of milk in his overall, Narvas uses a sprayer to paint the interior with Olympic One paint in Silver Feather. The sprayer makes it easier to reach all the nooks and crannies in the ceiling. The hooded overall and mask protect him from the overspray in the confined space. When all the details are finished, he’ll use a roller to prime and paint the floor. Now that the spraying is done, Narvas installs the side window. He uses a couple of pieces of trim to hold the frame in place while also allowing the window to be raised a few inches for ventilation. The finished window looks out over the border. The window was such an unexpected find at a nearby antique shop and adds a touch of age that isn’t always apparent in a new build. Next up, the pergola and patio! Stay tuned for our next post to see the space around the shed come together. It turns out so well, y’all. And you can do it, too! Hannah and Kurtis had never built a shed before. You should have seen Narvas’ first shed…. I guess what I’m saying is, don’t be afraid to try something new. Thanks to our project sponsors, Lowe’s Home Improvement Stores and Olympic/PPG, for making this series possible!